This meal is perfect for individual tastes. Everybody can create their own masterpiece with the ingredients they want and leave off those they don't care for. 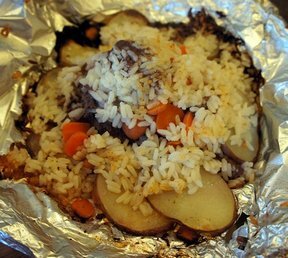 When done on the grill the potatoes and rice get a little crunchy. Combine meat, egg, pepper, salt, garlic powder and Worcestershire sauce together and mix well. Divide mixture into 4 patties. 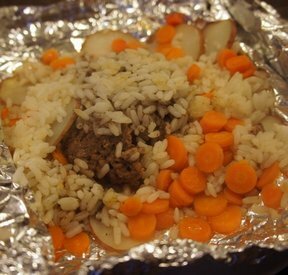 Place each patty in the center of a piece of foil large enough to wrap meal. 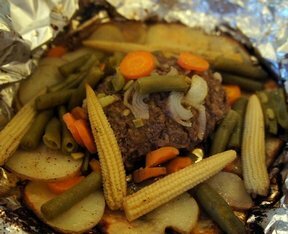 Divide onions, carrots, potatoes, celery and rice among the patties. 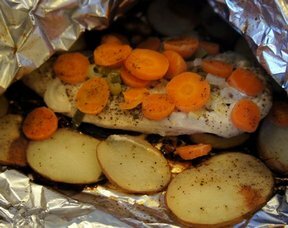 Wrap in the foil and bake at 350 degrees for 45 minutes. These also work well on the grill. "Reminds me of summer! Good idea on the rice to add a little more to it. We make these at the campground."